I don’t share many recipes here, but this one is simply too incredible not to spread. These ribs can be prepared ahead of time and reheated – in fact they’re even better the next day. The recipe comes originally from Food & Wine magazine, circa 1990, but I’ve simplified it somewhat for the busy parent. Heat oil in large pot, add the ribs, and brown all over. Remove ribs, reduce heat to medium, and add garlic, onions, and ginger. Cook, stirring, for about 3 minutes, careful not to burn the garlic. Return ribs to pot, add ketjap manis, star anise, brown sugar, vinegar, and enough water to cover ribs. 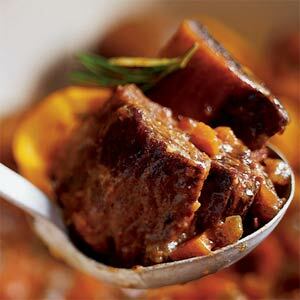 Reduce heat, cover pot, and simmer for at least 2 hours, until meat is very tender. (If the liquid evaporates too much, add a bit of water. If the sauce is too thin, boil until the liquid coats a spoon.) Skim any excess fat. In a heavy saucepan, add 1 cup sugar, 1 1/4 cups light soy sauce, 2 bruised garlic cloves, and two whole star anise. Cook over medium heat until slightly thickened, about 10 minutes. You can pour any extra into a jar and keep it in the refrigerator for up to 2 years. You have to try these ribs. They’re super simple to prepare, and the fragrance of them cooking is utterly irresistible. Serve them up with plain steamed rice, steamed bok choy with oyster sauce, sauteed spinach, or crunchy sauteed snow or sugar snap peas, and you’re in heaven. If you’re looking for a wine to pair with these, go with a cold, crisp, citrusy New Zealand Sauvignon Blanc or a good Grüner Veltliner. Enjoy! I’ll have to try these! The wine should not be a challenge 🙂 And I can gluten-free-ise the sauce by using GF soy sauce, so all good! Thanks! Let me know what you think after you’ve tried them. I think they’re, as I said, amazing.